Closed on all public holidays and Jewish festivals. Your welfare & security. Our priority. Strengthening the Victorian Jewish community and your place in it. A Victoria in which members of the Jewish community live as Jews in peace and security, participating fully and without prejudice in all aspects of society. 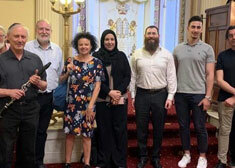 To be the recognised and responsible peak body and voice of Victorian Jewry through advocacy, representation, networking and collaboration, both within the Jewish and wider communities. Enter your name *This field is required. *This is not a valid name. Enter your e-mail *This field is required. *This is not a valid email address. Enter your phone *This field is required. *This is not a valid phone number.